First mentioned in a charter of 973. The name meaning the wood where the ground is gravely, it was settled comparatively late, the soil making it unsuited to cultivation. From medieval times it was a royal manor, which was held for many years by the Walsingham family. The village soon became a popular location with Londoners looking for property in the country, it being high and well drained but little in demand for agriculture. 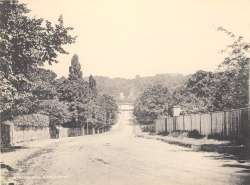 The arrival of the railway in 1865 had little immediate impact, as the station was remote from the traditional centres of population at Prickend (now the High Street) and around the church, but the arrival of the exiled Emperor Napoleon at Camden Place in 1870 added to Chislehurst’s standing and the area around the common soon became fashionable with city workers and businessmen. Larger properties were also developed in the more remote parts of the parish. 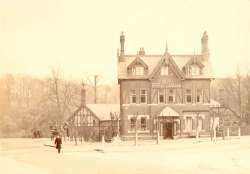 Most of Chislehurst’s development occurred during the Victorian period with only small-scale changes during the first half of the twentieth century mainly on the Eltham/Mottingham borders where new houses covered the former fields and on the Orpington border where the new garden suburb of Petts Wood (described separately) was developing. Subsequent development has been restricted to the replacement of Victorian houses with modern flats and houses; as a result Chislehurst retains a village atmosphere especially around the common, which has never been fully developed. It continues to be a fashionable place for wealthy Londoners requiring quick access to the city combined with the quiet of the countryside, but with roads little changed in the last 50 years it is one of the most congested parts of South East London.